IoT enabled elevators make use of artificial intelligence (AI) to enable vertical transportation of passengers and commodities. It is a process of upgrading the critical parts of the elevator in order to handle new technology, perform better, improve safety, and ensure the aesthetics are up to date. IoT enabled elevators display features of energy efficiency, reduce waiting time, and communicate with service providers via a mobile application. In recent times, many technological advancements have taken place in the IoT in elevators market. Hotels, hospitals, parking buildings, and the commercial, residential, and industrial sector widely use IoT in elevators. Therefore, the IoT in elevators market is expected to expand at a rapid pace in the coming years. Growing need to adopt new IT solutions with modern consumer trends across the world is driving demand for IoT in elevators. This is anticipated to drive the market over the forecast period. Moreover, increasing demand for safe and power efficient technologies from the construction industry is expected to fuel the growth of the market in the near future. However, high initial investment is anticipated to hinder the growth of the market across the world. The IoT in elevators market is likely to reach a value of US$ 50.76 Bn by 2026 from US$ 13.49Bn in 2017, expanding at a CAGR of 16.1% during the forecast period. Based on component, the IoT in elevators market can be segmented into hardware, software, and services. The hardware segment accounted for a significant market share globally in 2017.This segment is projected to maintain a significant market share over the forecast period. There is a rising need to install elevator remote monitoring systems in smart elevators to prevent accidents. M2M gateway or elevator gateway are designed and developed in elevators for secure communication between the lift controller and remote monitoring sites. The services segment is estimated to expand at a rapid pace during the forecast period. Services segment is further divided into designing & engineering, installation, refurbishing, maintenance & repair, and managed services. Installation accounted for major market share in 2017 and is anticipated to maintain its leading position over the forecast period. However, refurbishing services sub-segment is expected to witness tremendous growth over the forecast period due to growing attention toward elevator modernization in the commercial and residential sector across developed regions. On the other hand, the software component is expected to witness prominent demand due to rising application of analytics software, IoT platforms, and security software. Cloud software sub-segment accounted for leading market share in 2017 and is expected to expand significantly during the forecast period, as cloud-based services enable users to access several resources with the help of the Internet. It provides more flexibility and scalability and delivers product updates more regularly with little to no IT involvement. On the basis of application, preventive maintenance application in elevators accounted for leading market share in 2017 followed by remote monitoring, and is expected to retain its position over the forecast period. Preventive maintenance maximizes the efficiency of elevator’s, and helps to reduce elevator costs. However, remote monitoring application segment is expected to expand at a significant pace over the forecast period from 2018 to 2026 as it improves smart elevator maintenance and reduces the disruption of service to customers. Based on end-user, the IoT in elevators market can be categorized into residential, commercial, and industrial. The commercial sector is the prominent user of IoT in elevators followed by the residential sector, while the residential sector is projected to expand at a rapid pace over the forecast period. Residential sector is projected to witness higher level of adoption, thereby creating a high potential customer base. The market in North America is anticipated to contribute significantly to revenue in the near future due to a large base of existing users in the region. North America and Europe are mature regions of the IoT in elevators market in terms of technical awareness among users. This is likely to contribute to the decline in market share of these regions. Furthermore, the market in APAC, South America and Middle East & Africa is likely to expand at a robust CAGR in the coming years. Attracted by the increasingly expanding IoT in elevators market, many small and large scale vendors are investing in IoT in elevators in order to improve elevator maintenance and reduce the chances of accidents. Product innovation and upgrade of research and development are constantly taking place in the IoT in elevators market. For instance, in May 2018, Otis Elevator Company launched its first high-speed Gen2® elevator, equipped with innovative features including a new interior, smart & connected functionality, fashionable look, and higher functionality, for the global high-rise market, expanding its popular Gen2 family of elevators. 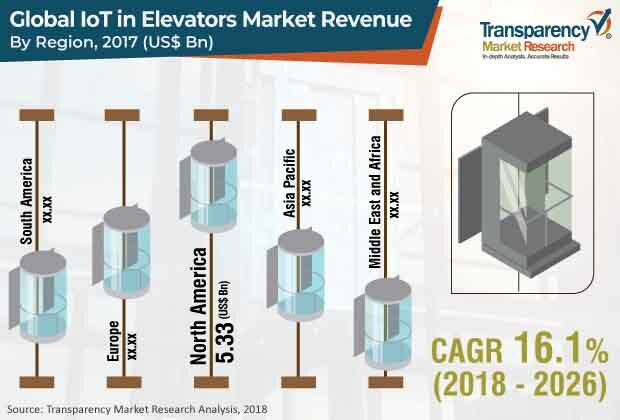 Prominent players identified in the IoT in elevators market and profiled in the study include ThyssenKrupp AG, KONE Corporation, Otis Elevator Company, Schindler Group, Mitsubishi Electric Corporation, and Toshiba Elevators. This comprehensive report titled IoT in Elevators Market-Global Industry Analysis, Size, Share, Growth, Trends, and Forecast, 2018 – 2026, by Transparency Market Research analyzes and provides growth forecast for the IoT in elevators market at the global and regional level. In terms of region, the market has been classified into North America, Europe, Asia Pacific, Middle East & Africa, and South America. The report provides analysis for the period 2016–2026, wherein 2018 to 2026 is the forecast period and the base year is 2017. An in-depth and unbiased market assessment has been made to offer readers insightful and accurate analysis. The report emphasizes on all the major trends and services that play a key role in the expansion of the IoT in elevators market between 2018 and 2026. It also focuses on market drivers, restraining factors, and opportunities of the IoT in elevators market during the forecast period. The report includes a detailed value chain analysis and opportunity analysis, which is focused on providing anextensiveview of the global IoT in elevators market. Porter’s Five Forces analysisis also provided to understand the competitive scenario in the market. The study incorporates IoT in elevators market attractiveness analysis, in which market segments based on componentsuch as hardware, software, and services are benchmarked based on their market size, growth rate, and attractiveness in terms of opportunity.In order to provide a complete analysis of the overall competitive scenario in the IoT in elevators market, attractiveness analysis of every geographic region mentioned in the reporthas been provided. An overview of the IoT in elevators market detailing key trends and dynamics has been included to providea clear understanding of market driving forces. The dynamics include impact analysis of market drivers, restraining factors, and opportunities of the IoT in elevators market. Additionally, the report provides analysis of business strategies adopted by market leaders in the IoT in elevators market. Trends and services related to IoT in elevator systems along with their applications have also been explained in the report. The study provides a decisive view of the global IoT in elevators market, broadly segmentedbased on componentinto hardware, software, and services; based on application into preventive maintenance, remote monitoring, advanced reporting, connectivity management, and others; and in terms of end-user into residential, commercial, and industrial. Further, the report provides a detailed breakdown of the IoT in elevators market across geographic regions, which include North America, Europe, Asia Pacific, Middle East & Africa, and South America, thus providing valuable insights at the micro and macro levels. The report highlights the competitive scenario within the IoT in elevators market, ranking all the major players according to key recent developmentsand their geographic presence. The insights into the IoT in elevators market are a result of our extensive primary interviews, secondary research, and in-house expert panel reviews. Thesemarket estimates have been analyzed byconsidering the impact of differenteconomic, political, social, legal,and technological factors. The market in North America has been segmented into the U.S., Canada, and Rest of North America. Furthermore, the market in Europe has been analyzed across France, Germany, the U.K., and Rest of Europe. The IoT in elevators market in Asia Pacific has been segmented at country level into China, Japan, India, and Rest of Asia Pacific. The Middle East & Africa region covers GCC countries, South Africa, and Rest of Middle East & Africa. Similarly, South America includes Brazil and Rest of South America. This report provides all the strategic information required to understand the IoT in elevators market along with component, application, and end-user. Primary research involves telephonic interviews, e-mail interactions, and face-to-face interviews for detailed and unbiased reviews of the IoT in elevators market across geographies. Primary interviews are usually conducted on an ongoing basis with industry experts and participants in order to obtain the latest market insights and validate existing data and analysis. Primary interviews offer new and fresh information on important factors such as market trends, market size, competitive landscape,growth trends, etc. These factors help validate and strengthen secondary research findings. Moreover, the data collected and analyzed from secondary and primary research is again discussed and examined by our expert panel. The research study includes profiles of major companies operating in the global IoT in elevators market. Market players have been profiled in terms of attributes such as company overview, financial overview, business strategies, and recent developments. Parameters such as investment and spending and developments by major players of the market are tracked. Some of the key players in the IoT in elevators market are ThyssenKrupp AG, KONE Corporation, Otis Elevator Company,Schindler Group, Mitsubishi Electric Corporation, and Toshiba Elevatorsamong others.